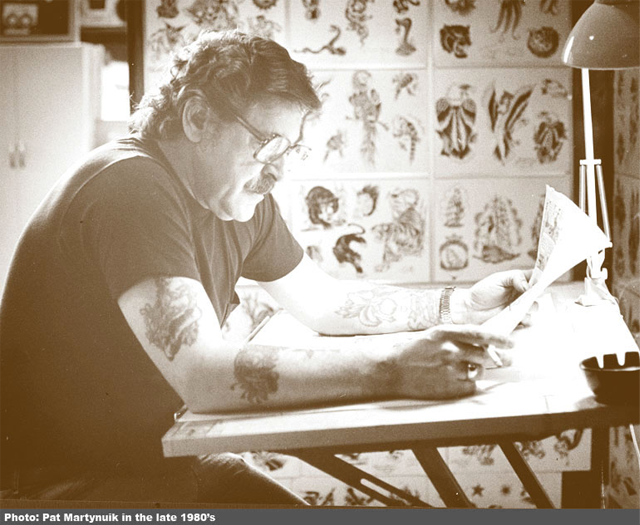 Picture Machine tattoo was founded in 1976 by Pat Martynuik, who had moved to San Francisco from Canada in 1970. Pat began tattooing as a hobby, picking up tips from Doc Forbes and his friend, Huck Spaulding, and went on to own and operate his own shops in Edmonton, and later, Calgary. Upon his arrival in San Francisco, Pat began working at Lyle Tuttle, Sr.’s shop on 7th street next to the bus station, just south of Market St. During this period Pat taught the trade to his own son and Lyle Junior. He also earned his nickname, “ The Picture Machine” for the long hours he worked and his constant productivity -Pat was at the shop 7 days a week, and at any given moment he was either tattooing or drawing flash. 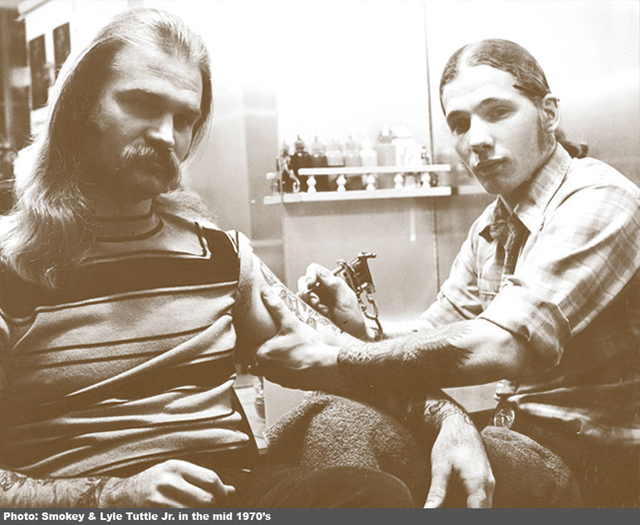 In 1976 he decided to part ways with Lyle Sr., and opened his own tattoo shop at 3940 Geary between 3rd and 4th avenues, where he resumed the habits that earned him his nickname. In 1989 Pat died in the shop, basically while in the middle of a tattoo. The Picture Machine became the property of his son, Guy, who by this time also owned his own shop, body Graphics, in Reno, Nevada. Guy maintained operation of the Picture Machine and his Reno shop for a year, and taught his own son Jesse, who now owns body Graphics, to tattoo as well. In 2005 Guy Martynuik sold the shop to his former coworker Lyle Tuttle Jr. Lyle Jr had been born and raised around tattooing. He had done his first tattoo at the age of 12, and started working under the supervision of Pat Martynuik at his father’s shop, while Lyle Sr. was globetrotting to promote tattooing (and himself). He lived at the tattoo shop, and essentially worked 16 hour days, 7 days a week, preparing the shop in the morning, cleaning up at night and doing anything else that was required after hours. He worked at the 7th street location for 2 years, after which he moved to Hollywood to open another Lyle Tuttle tattoo shop on Sunset blvd. 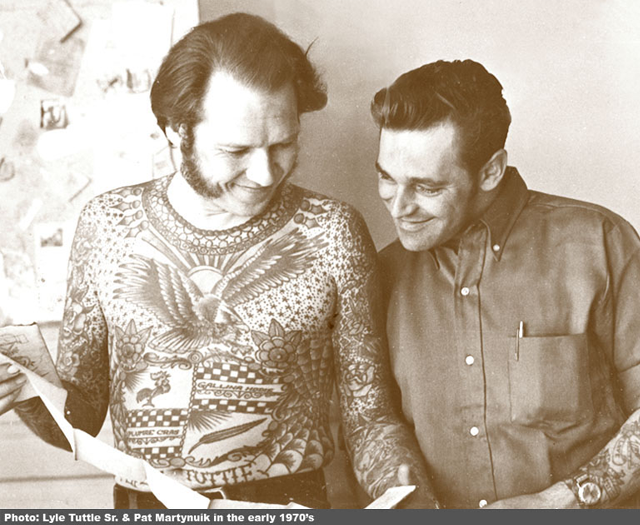 1 1⁄2 years later his father sold the Hollywood shop to Cliff Raven, and Lyle Jr. returned to San Francisco, did a short stint back at 7th street, and then moved to Vallejo across the bay, to open yet another Lyle Tuttle tattoo shop. Lyle Jr. purchased this shop from his father shortly thereafter. He worked and ran the Vallejo shop for 10 to 12 years, until the local naval base was closed and business dropped off, at which time Lyle Jr. sold the shop to “Fuzzy”, who maintained it for a short time (less than a year), before it finally closed. Lyle Jr., for all intents and purposes retired from tattooing at this point and went on to work in construction, as well as a number of other shady enterprises. In 2005 Lyle Jr. stopped by the old Picture Machine location to say hello, and a month or so later realized that he had somehow managed to buy it. By this time the Picture Machine building, the building that had at one time housed the tattoo shop, the suicide prevention center upstairs and a Korean video store, was sold by the owner, and Picture Machine Tattoo moved down Geary to 5124 Geary at 15th avenue, where it is today. During its years of operation, the Picture Machine’s reputation as a no nonsense street shop producing high quality tattoos in an unpretentious environment attracted some of the best young up and coming artists to seek employment there. The list of artists who have worked at the Picture Machine includes many, if not most of the names of tattooers who during the nineties became household names for tattoo fans, and who today are considered to be responsible for breathing new life into the world of tattooing. Today Picture Machine Tattoo maintains its reputation for quality tattoos applied in a bustling street shop environment, long hours of availability to customers, as well as high end custom work made to order for discriminating tattoo collectors. Pat Martynuik received his nickname (Picture Machine) because of the speed at which he worked and the long hours that he put in. The first letter of the words also match his initials. Pat was a native of Vancouver, Canada. He started tattooing as a hobby, picking up pointers from the resident Vancouver tattooist Doc Forbes and friend of many years Huck Spaulding. In the 1960's Pat was working further north than any known tattooist in North America. He set up in the inland town of Edmonton, Alberta, Canada and turned his hobby into a booming business. The flash sheet seen in this display is from that era. This shop was a big success so he opened a branch in Calgary. In 1970 Pat emigrated to San Francisco and worked at the famous #7th Street studio of Lyle Tuttle. He brought new life to that location and built up a loyal clientele In the bicentennial year of 1976 he opened the Picture Machine shop at the 3940 Geary blvd., where he worked until his untimely death.